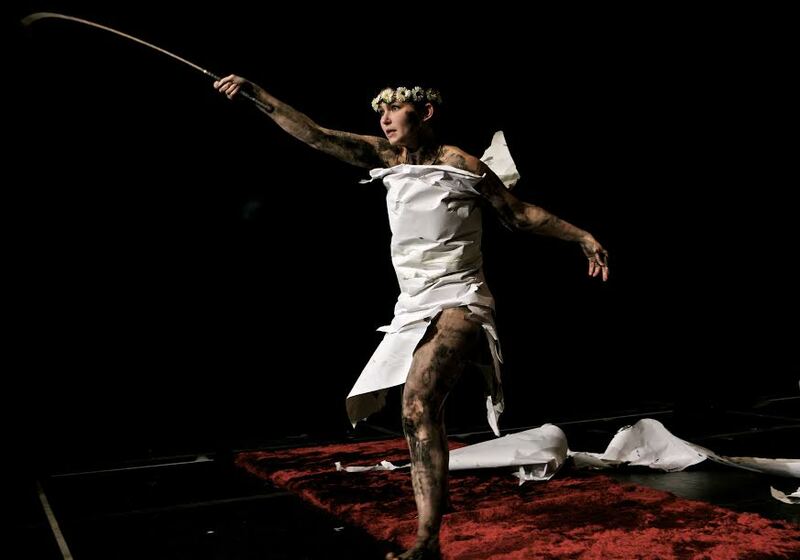 Belarus Free Theatre can claim that not only is it underground in form but also in substance. What it discusses in its plays is subversive: it challenges basic principles that constitute modern society. Of course, the substance of the underground exists on a spectrum, all the way from Dostoevsky to VICE magazine. After seeing four of their productions this last fortnight I would happily place the company nearer to classic Russian literature than modern slipshod journalism. Here is a work of violence and anger that BFT channel as very few London companies could ever. The great achievement of this production is that it produces sensational overload in spite of, or indeed because of, its minimalist stage. In contrast to the cavernous setting of Price of Money, director Vladimir Shcherban emphasises intimacy, yet an intimacy that is fundamentally frustrated. As an adaptation of New York in 1979 by Kathy Acker (a feminist firebrand of the late 20th century), New York ‘79 shows a society in failure: despite attempts at sublimating human desires into more civilizing activities, humans are more disconnected and asocial as ever; in particular, sexual desire has been warped into a game of conflict where neither side receives the satisfaction they should and to the extent that they believe are undeserving of such satisfaction. BFT are remarkable in how they present this: in every scene there is a fundamental loneliness despite the presumption of togetherness in the various settings. A downtown club, being a place of pleasure and communal experience, is instead a savage beacon of repression and anxiety: the genuine aggression of the dancing, the quarantine-style translucent curtains, the self-spraying graffiti artists, the immobility of a fat-suited woman and the hard, blaring dance music all contribute to a nauseating alienation. There is particular horror in the scenes with a girl and her grandmother, where only once the grandmother mentions a generous inheritance does the girl feel genuine interest in her existence; otherwise, the grandmother is abandoned, moribund and pathetically asexual. Shcherban’s considerate decision to have her in a garish victorian-era dress points to these attributes while her being in a wheelchair shows she has become separated from the body she should rightfully inhabit. Imposing itself over all of this is the only significant piece of set, the yonic red curtains, that form a consistent barrier between characters and between audience and character, signifying the permanent and man-made separation that persists in an unnatural society. . Admittedly, the grotesqueness of the whole piece does eventually numb; however, BFT’s adaptation generally remains a powerful experience of a culture that strangles and distorts the genuine desire of people and a warning of how that culture still persists in its many pernicious forms today. It is difficult to give commentary on this production when its qualities are so similar to those of the previous piece. Set during the aftermath of the elections for the incumbent Belarusian president Lukashenko—whose reign is referred to affectionately by the BFT as the ‘last dictatorship in Europe’—Minsk, 2011 uses snapshots of repression the same way as Acker’s piece does, although it is generally more willing to indulge in physical theatre to get its point across. What this piece possesses that the former does not, however, is a more nuanced conflict: while you could say Acker would not mind if New York had burned to the ground while she wrote her novel, the participants of this piece are unashamed to admit that despite the civil rights abuses and constant oversight of the KGB they love their city; this all coalesces into a charming rendition of a folk song in the play’s final moments, reminding us that despite BFT’s criticism of their country, it is ultimately the place where they grew up and had some of their most crucial experiences. While the piece retains an In-Yer-Face style that the company clearly excels at, what tempers the play’s power is its materiality. The way the problems are presented in the piece—its constant references to the secret police, its use of real images of Minsk and its fourth-wall breaking stories from each cast member places the work too much in its own time—it sacrifices the eternal quality of the struggle against despotism and instead is a work that only BFT could reasonably perform and one that could only be performed in the present day. This personal quality of the play could be seen as an advantage; however, it ultimately produces a sense of inaccessibility within the audience. Despite this, Minsk, 2011 still holds dramatic weight and for that reason it is a decent reply to Acker’s inimitably strong work. This is the only play I watched that was not staged at a secret location, but rather at the Young Vic itself (which has facilitated BFT’s season of shows in London). As to be expected, Time of Women is the most formally conventional of the performances I have seen. This is not necessarily a weakness, yet it does as a consequence lack the furious energy of its predecessors. Here we see the stories of three real Belarusian political prisoners—Irina Khalip, Natalya Radina and Nasta Palazhanka, their early days of jail and their retrospections years after release. Although in reality these people only stayed in jail for at most two months, the focus is on why they were jailed, the dread of continued incarceration and the intimidation tactics used to force their recantations. Its slow, enervating pace operates precisely to its advantage, matching the rhythms of jail that then echo in their seemingly hollow ex-convict lifestyle. While the characters are indivisible from one another when together there is a pleasant assertion of human resilience in their collective scenes: each actress creates the natural ambivalence of having to instill hope in their fellow prisoners while slowly losing it themselves. The downside of these moments is that they never truly capture the dread of prison and merely approximate it. To counter this there is the use of a camera that films action of the prison cell happening offstage, as though the audience is participating in the voyeuristic activity of a prison official; the back wall of the stage is then dropped to reveal the cell from which the action has been filmed. It is a decent image, used to bring the plight of the characters into a stronger sense of reality, yet it is not enough to create genuine vicarious experience. The best scenes are those of the characters facing the warden, a disgruntled ex-soldier who is more interested in the pot noodle he eats than the injustice he witnesses daily. It is these moments that each character is individuated, reacting to his threats in distinct ways. The main threat directed at the prisoners is that of infertility: they found out that as their malnourishment deprives of them of adequate sustenance, their reproductive systems will eventually stop working. This is what dominates the thoughts of the characters, all of whom have familial aspirations. The ever-present (though hamfisted) image of mandarins which fill the stage is a constant reminder of this worry, although I argue that this notion of infertility is laboured too much on, as though in producing this idea the writer was struggling to find a female-only aspect of prison life. Beyond this, there is not much else of interest. With its bookending of clunky factual information, Time of Women possess the same material problems as Minsk, 2011: its emotional resonance cannot exist without a persistent reference to current events. Of course, nothing escapes context, but better plays rely more on their own stories than those of others.